The official Cyberpunk 2077 Twitter account courted controversy today after a tweet that some considered transphobic. This is not the first time that a CD Projekt Red-affiliated Twitter account has needed to apologise for a tweet. 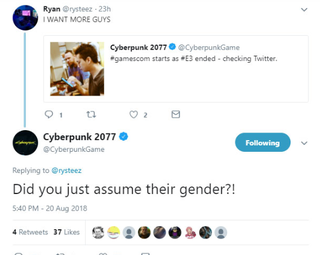 Responding to a fan on Twitter earlier today, the official Cyberpunk 2077 Twitter account referenced an internet meme mocking transgender people. “Did you just assume their gender,” the tweet said. The account was responding to a fan saying that they wanted more from the “guys” at Gamescom. CD Projekt Red is currently showing Cyberpunk 2077 at the event. While the tweet is not explicitly transphobic, the meme being referenced is largely used to belittle or demean the concerns of transgender people. Much like saying how you’ve decided to identify as an attack helicopter is a way to mock transgender folks, this phrase is meant to mock the supposedly fragile egos of “tumblrinas” and social justice warriors. It’s not clear whether or not the employee responsible intended it as offensive. The tweet was later deleted and an apology issued. CD Projekt Red did not immediately respond to a request for comment. By itself, this is just a PR faux-pas, but this is not the first time a CD Projekt Red-related Twitter account has posted questionable content. Last July, the official Twitter account for GOG, the game storefront owned by CDPR, tweeted an animated GIF from Postal 2: Paradise Lost depicting the main character urinating on a tombstone marked Games Journalism. The date on the tombstone, August 28th, 2014, was a reference to GamerGate. The tweet was later deleted. At the time, I asked GOG’s Head of Global Communications Łukasz Kukawski about their vetting process for social media managers.